TsukuBlog | I’ve Discovered One In Tsukuba at Last! A Horse-Headed Kannon Sacred Stone with an Actual Horse-Headed Image! Horse-Headed Bato Kannon In Saiki, Tsukuba. To the left are some Y-shaped zakumata sticks (unique to this part of Japan) which are offered as prayers for easy delivery in child-birth. 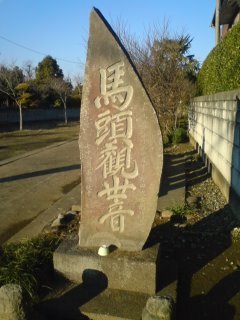 Tsukuba City and its environs are a treasure trove of sekibutsu (石仏), which when directly translated means stone Buddhas, but can be best understood as being sacred or devotional stones. 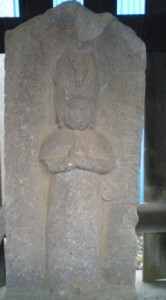 These free-standing blocks or slabs of stone, some lower than knee high and others rising well over a man’s head, are dedicated and give homage to various deities, Buddhas or regularly held devotional meeting or ceremonies, and were placed at numerous strategic points around traditional hamlets. To make them easily recognizable in terms of what type of sekibutsu they are, they can have either a standardized carved image of the god or Buddha they are meant to represent, or instead, JUST THE CHARACTERS which identify them engraved into the stone. 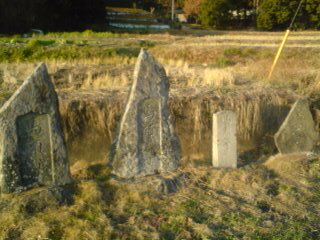 BATO-KANZEON in front of Hannya-Ji Temple, Tsuchiura. This temple is famous for its old bell (one of the so called “Three Great Old Bells” of Hitachi Province. It was temporarily declared a national treasure, during the Second World War, to save it from being melted down to make armaments. Though rarely great works of art in this area, these stones are often rustically captivating, even enchanting, especially in the proper setting. More importantly, they are a slowly fading testament to past generations’ religious beliefs and everyday concerns, which most often meant the health and safety of the family and village. Bato Kannon in Saiki, Tsukuba. 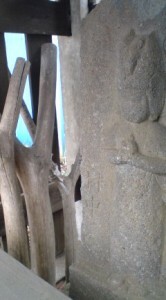 You can see the weather-worn horse-head high up on the deities brow. It is interesting that one of the most common types of all the sekibutsu found in the Tsukuba area was not commissioned and put in place with the well-being of humans in mind.The BATO KANNON (馬頭観音, which means horse-headed Kannon Boddhisatva) monuments, which can be found, sometimes in relatively great concentrations, in the old neighborhoods of our city, are dedicated to the health and safety of domestic ANIMALS, especially horses. Until the proliferation of the automobile, the horse was, of course, extremely useful and important. Keep in mind, however, that during the Edo Period (1600-1868), most Japanese were NOT PERMITTED to actually ride horses, even if they owned them. They were used as beasts of burden, for farmwork and the transportation of goods . Eastern Japan (of which Tsukuba is a part) was a traditional horse breeding area and, during the Edo Period and beyond, Bato Kannon (馬頭観音) monuments became extremely common. They were placed at interesections, roadsides, hitching posts (traditional parking lots) and watering troughs, and at places where the corpses of horses were buried. These monuments served two purposes: to pray for the health and safety of living horses, and also to console or make supplications to the spirits of horses which had passed on. 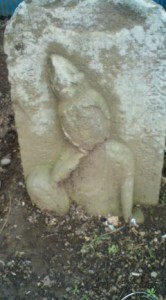 Though very common, all the BATO Kannon SEKIBUTSU I had ever found in Tsukuba had been been stone slabs with the characters 馬頭観音 (BATO Kannon) or variants such as BATO-ZON (馬頭尊), or BATO-KANZEON (馬頭観世音), engraved on them, without any identifiable carved IMAGE. In this case, the identifying features would be an angry faced human-like figure with a horse’s head jutting out from his own. Despite the fact that in this area many other types of SEKIBUTSU feature carved standardized images of various deities (including other Kannon Boddhisatvas of which there are seven types), especially the Niyoirin Kannon, with its head tilted and resting in its hand, I had never found around here any Bato Kannon stone featuring the classic horse-headed image. 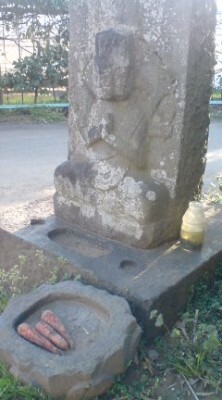 I HAVE seen these in several temples or on stones in other areas, the fiercely visaged deity (all other kannons have serene, merciful expressions) with a horse’s head stuck on top, sometimes with multiple arms. When I asked the curator of the local history museum if there was such Bato Kannon in Tsukuba, he said there were none. Nyoirin Kannon in Saiki, Tsukuba. These easy to recognize deities (head resting in palm) are considered protectors of women, pregnancy and childbirth. They are among the most common sacred carvings found in Tsukuba Many villages in the area hold prayer sessions for Nyoirin Kannon on the 19th of every month ( or the 19th of certain months of the year). No, I had never found one. Until last weekend, that is. Strolling through the center of the old Saiki neighborhood, I came to its central square. This always seems to me an odd feature , as traditional Japanese hamlets did not have squares. This open area is where an old Kashima Shrine once stood. The deity of that shrine was transferred into the Saiki Jinja Shrine (which now houses 3 different gods) and on the space where the Main Hall once stood, elderly residents now enjoy gateball or drinking tea. The perimeter of this SQUARE is lined which small shrines (hokora) containing various sekibutsu, often adorned with offerings. Of course I had examined these all before, but I figured I would see if some interesting newofferings had been made. I was glad to find a new batch of freshly placed ZAKUMATA (y-shaped sticks which are used to pray for easy delivery), inside of one of these small hokora. I stuck my cell phone camera in, and took a couple of pictures. Checking them, I noticed that the stone figure in the same small shrine, had a horse’s head on its own forehead. I quickly stuck MY HEAD into the hokora to make sure. Yes! Though very eroded, it was surely a horse’s head! 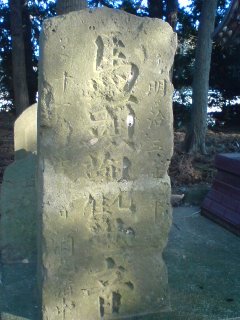 I checked the date inscribed on the stone KANSEI 11 (寛永 十一), which is 1799! Now I understand the erosion! 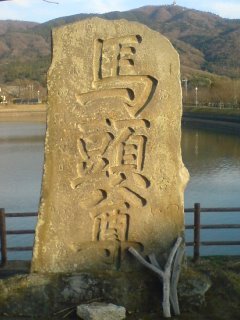 In Tsukuba, almost all of our many Bato-Kannon stones are inscribed with characters only, and have no sculpted image. I hope you can recognize them now. When you find one, or even a group of them lumped together at one spot, you can try to picture how that place was once a hitching post or watering area. Maybe it’s the site of horse graves. Anyway, you can take a moment to contemplate all the hard working and long suffering animals who are around no more (replaced by machines) and the loving care and devotion that some people gave them (well…sometimes). Congratulations on your discovery of Bato- Kannon with an actual horse-headed image! From the title I can imagine your excitement-your face with a big smile. Your essay taught me that Tsukuba had a lot of historical treasure,especially ,unknown to people very much. To say honestly, I moved here three years ago and live in the center near TX station with no car. Was I interested in a local history? I have to say No. ‘Dosojin’ just reminded me of the first paragraph of ‘Okuno Hosomichi written by Basho,that is, I have lived without observing the real things with my own eyes. You are studying Japanese culture much more we are、aren’t you? I learned a lot of new interesting things about my country from you! Thanks a lot! I’m looking forward to reading your essay as long as you keep on writing. Thank you for your comments and for reading TsukuBlog! I think that your Basho quote is very important for enjoying life in Tsukuba and for appreciating its special history and customs. Lets all keep our eyes open for the interesting details which,we are often on too much of a rush to notice. If you find anything interesting please let us know!